I stayed at Dobbins Famcamp twice about 10 years ago with a 36' fifth wheel trailer and dually pickup. I experienced the same policies about reservations, etc. cited above. When there were no vacancies I was allowed to park for a couple days in an adjacent parking lot next to some tennis courts. These were used daily by Marine units as their group formation PT facility. The RV park did have some long term residents, who I was told were duty personnel working at the base. The park appears to be a very old design, laid out before modern RV became available. It was carved out of a pine tree forest on a hillside. So most of the sites involve steep slopes to access the level pads. There was a very tight turn around a pine tree in the one-way circular road. All but a couple of the sites had very steep access drives from the road into very short concrete pads. The excessively steep inclines of the pad access drives were in many cases too steep to even consider with my large trailer. The inclines required either uphill or downhill backing to the pads. On the downhill ones my trailer bumper would have bottomed out when it reached the pad, due to the steep angle of the access driveway to the pad. On the up-hill ones, I don't know how well reverse gear in an automatic transmission would push a heavy trailer uphill. The road was one lane wide, dirt, with trees restricting maneuvering in and out of some campsites. 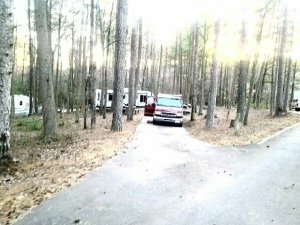 I determined that only a few of their campsites were even suitable for my truck and trailer to use. The other sites might be fine for a small trailer or single vehicle RV. I offered a list of suggested improvements to the park manager, and even walked the campground with him to point out spots needing improvement. It sounds like nothing has changed since my visit.